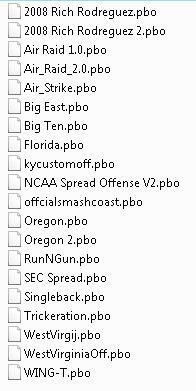 Here's all of my files, though most of you probably have all of them already. Any other dumps definitely appreciated. Here's the Detroit Lions playbook from FF. If anyone has the Westcoast1 playbook, please upload it. That was my favorite playbook, and I somehow lost it when my hard drive died. Thanks. jamesslash wrote: Here's the Detroit Lions playbook from FF. If anyone has the Westcoast1 playbook, please upload it. That was my favorite playbook, and I somehow lost it when my hard drive died. Thanks. Got you covered, thanks for the Lions' PB.